Recently I had a conversation with Tarek Fatah, Author of “Chasing the Mirage” a great book which exposes Islamists, who was also briefly joined by his fellow Indian Marxist Irfan Habib – a historian of Romila Thappar’s creed. I know very well that Tarek’s allegiance to Marxism is absolute and there are no two ways about that. What appalled me was there were no convincing answers for the counter arguments posed to him on his attempt to claim Nationalists like Netaji and Shaheed Bhagat Singh as Marxists. The reason why Tarek stands in different pedal is that he is not an Indian or not living in India at the moment and his focus is not India but to denounce every religion (especially Islam) in his own subtle way, that is not his mistake because that is a standard issue with any Marxist who is thoroughly indoctrinated and goes up to any length to prove that religion is rubbish. All this was said based on the history of papal cruelty on Europeans in the name of Christianity and he had no firsthand account of any other religion. For the millions who perished and are still dying so much for this euphoria called Marxist state did not get justice. Just like Jihadis who are killing and maiming for the establishment of caliphate in the name of Allah. Two evils that threaten this world at the moment is one Murderous Marxism and the other is Militant Islam. Tarek does what Marx intended to do with religion in abroad with Islam. With so much dark spots which Islam has on its back Tarek’s job of doing Marx on Islam is easy. But his fellows in India when they take up the job of doing Marx to Hinduism, problem arises. There are not many loop holes to say that the whole Hinduism is rubbish. The Indian Left is currently trying what Islamic Invaders have tried for over 800 years and what Christian invaders tried to do for 200 years, ie., converting this whole country from a Culturally Hindu Majority to 100 % Muslim or 100% Christian. Both the Abraham religions (Christianity, Islam) have lost its battle with Marxism because when it comes to atrocities they committed on non-believers they are gory. And in this context whatever Marx ranted about religion is more or less true with respect to these two religions. But when it comes to Hinduism which I have already called it a religion of thousand prophets and if I have to explain this to Marxists then Hinduism is a religion of 100,000 Marxists whose thoughts are so great which we can very well see it from the work they have produced and their teachings too. All hell broke loose when the moment I have uttered Murderous Marxists. Tarek has no answers for all atrocities committed by Marxists for which millions were killed by Stalin, Lenin and polpot in the name Marxist Garbage, not to mention that China executes thousands of people on an yearly basis in the name of capital punishment. And you will not hear a word from double standard Marxist Intellectuals when it comes to condemning the acts committed by China, simply because China is doing what Marx has prescribed to do. Violence is at the core of Marxist scheme of things. Let’s not forget what the murderer Mao said “Power flows from the barrel of gun” you do not need know any further. Violence is in Marxist’s genetic makeup. They do not give a damn about all that, cleansing is their priority which they have done and are still doing it to meet their end objective ie., to turn this world in to a communist state. Though he momentarily chose to call these Marxist killers as goons his stand is that he is a Marxist. Instead of answering the questions posed he started saying that Bhgat Singh and Netaji too committed Murderous acts or they too are Murderous Marxists. Let’s get this record straight. To call Bhagat Singh and Netaji as Marxists is a lie which the Indian Pseudo-Intellectuals are doing it for a very longtime. 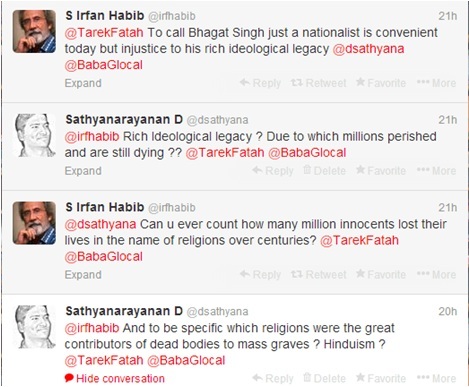 And Tarek’s argument sounded so hollow when he calls Bhagat Singh a Marxist because he happens to be an Atheist. This shows how deep he (and his fellow traveler) is in to this Marxist abyss. Either he does it willingly as a standard Marxist technique from the cook book given to him by Karl Marx or he does not know truth. Atheism is one of the central components of Hinduism. It is possible that you can be an atheist and a Hindu at a same time. But if you are a Marxist you have to be an atheist. There is no denial that Shaheed Bhagat singh was inspired by Marxism and he read so much about that, and the limited violence he engaged was against colonial oppressors not against his fellow men. He did not kill anybody because someone did not agree with Marxism but what happened when Bolshevik mobs took over the reins of power in Russia? And what the Murderer Stalin did once he became the ruler of Russia, not to mention Polpot and Cambodia. It is a blatant lie perpetuated by Marxists especially by the complicit Indian Left when they call Bhagat Singh and Netaji as Marxists, no they are Nationalists by blood. All they did is for the sake of Independence not for the sake of Marxist gibberish. If they have lived on to see what Marxism did to this world they would have called it as the ideology of liars and barbarians. It is convenient to quote a book written by Bhagat Singh called as “why I am an atheist” rather than to acknowledge the truth. Marxism is a failed Idea. There are umpteen examples throughout the world. If someone shows China and Cuba as success stories they are actually wrong, these are indeed aristocratic states. In an absolute Marxist state anarchy prevails, where supporters will be spared and not the others just like status of non-believers in a caliphate. There used to be days when most of the populace was illiterate they were easily deceived by this Mob called Indian Left with their cohorts in Media and political parties. It is not going to work anymore. While I would have no problem with Tarek and his band doing the Marx to Islam and Islamists, he may not be able to do the same to Bharath, Hindus and Nationalists. You see how they divert the issue and question. Thanks to Marxists for making this world a dangerous place to live. 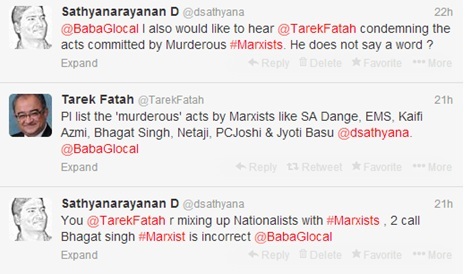 Aside | This entry was posted in India & World and tagged Islamic Fundamentalism, Left, Marxism, Nationalism, Tarek. Bookmark the permalink.